If you want to attract new patients, you’ll need to market yourself online – and to do this, you need a professional-looking website. More than 70% of adults in the U.S. search for health information online. This means you need a responsive site that looks good on any type of device, from computer to tablet to mobile phone. It also means that your site content needs to be written in a way that helps build trust in your healthcare practice. Email isn’t just a way to send routine information like appointment reminders. You can – and should – be using it to communicate with patients, even when they don’t need to visit your office regularly. Your email messages can be about anything, from a monthly Health Tip, to a quarterly eNewsletter, to an announcement about an upcoming event. And with a low-cost email marketing platform like Constant Contact or MailChimp, you can easily automate your email campaigns, so it won’t take up much of your time. The key to email marketing success is to ensure your content educates and engages with both current and future patients. Don’t Forget About Direct Mail! While email is an incredibly efficient way to communicate with your patients, it’s still easy for people to ignore an email. So, why not try sending out “Welcome to the Practice” letters to all new patients, or sending birthday cards to all your patients. Personal touches like this will help you keep your patients happy—and happy patients are much more likely to refer you to their friends and family. With more than 2 billion monthly active users, Facebook is a powerful marketing tool you can use to promote your practice – for free. However, a lot of healthcare providers don’t give their Facebook business page much thought after the initial set-up. Many people don’t realize it’s a great way to engage with patients – for example, you can post a “Fitness Challenge” and ask people to post a picture to show they’ve completed it. Facebook helps you hear what your current (and future) patients have to say and helps them feel more connected to you. And it’s the ultimate way to get word-of-mouth referrals. Today, people often use online reviews as a first step to find a new doctor. Unfortunately, they typically focus on the bad reviews more than the good. So, tobuild (and manage) your online reputation, you need to embrace online ratings and reviews. Ask your patients to rate you: add a clickable link to your website, send an email request, or keep a tablet at the front desk where patients can review you before they leave your office. Ideally, you want new reviews every week to build up your total volume of positive reviews. In time, and with enough positive reviews, your ratings will rise to the top in any online search despite a few (inevitable) critical reviews. Medical professionals work with iHealthSpot because they know they need a full-service digital marketing partner that can support the unique needs of their healthcare practice. From award winning medical website design and proprietary patient education content, to online marketing including social media and reputation management, we enable medical practices to market themselves using proven online and offline marketing strategies. If you are interested in learning more, contact us today, toll-free at (877) 709-0999 for your FREE consultation with our marketing experts today! People today are accessing your website from their smartphones and tablets even more than they do from a desktop or laptop computer. If your site isn’t optimized for mobile, visitors accessing your site will be forced to scroll from side-to-side to read your web pages. Or have to pinch-to-zoom because the words or buttons on a page are too small. This is a bad user experience and causes many people to immediately leave a site. To avoid this problem, you need a responsive medical website design that delivers an optimized experience that enables your site to adjust to a variety of screen sizes, for a variety of devices. If your site has any broken links, visitors will know right away that you haven’t updated it in a long time…which means the information they see may not be correct. They may also assume that your website is no longer active. Every website should have a custom 404 page. If your website doesn’t provide one and someone mistypes your URL in the search bar, they may even think your healthcare practice no longer exists. In addition to being well written, your website’s content should also be easy to read. Best practice is to have a strong contrast between the text and the background. Also, avoid backgrounds that are busy as they can be distracting, making the text harder to read. This is especially important to help convert “visitors” to “patients”. It doesn’t make sense to explain what sets you and your practice apart from other local practitioners, without also letting your site visitors know what to do next. Simple Calls to Action like, “To learn more about our services and capabilities, call (012) 345-6789,” make it very easy for a potential patient to get in touch. A Call to Action is only helpful if people can find it. What if someone visits your site but doesn’t understand where to go and which pages to view? People visiting your website should be able to easily find what they need. While this seems obvious, studies have shown that a majority of small business websites don’t provide any direction or ask people to click around the pages. Your main navigation is arguably the most essential – and ever present – aspect of your website. Also, your site should include clear headlines and easy to find content that explains what you do. A “Contact Us” form may seem like an easy way for people to reach you with their questions, but it isn’t the only way to engage with potential patients. Make it easy for people to get in touch with you via the phone and social media. If a visitor isn’t able to easily find this type of information, they’ll probably leave your site to find another practice that is easier to contact. Shorter attention spans are not just making people check their phones several hundred times per day. They’re also making people really impatient when it comes to waiting for websites to load. According to the latest research, 47% of people expect a web page to load in two seconds or less, with 40% bouncing if a site takes more than three seconds to load. And even a one-second delay can decrease patient satisfaction by approximately 16%. So, when designing your website, avoid heavy images, unnecessary media, or animations that will slow your site’s load time. Too many pop up messages are a sure way to turn people away from your website. They irritate people the moment they appear on their screen, as they severely disrupt the reading experience… And the last thing you want to do is keep people from accessing the high-quality patient education information that your site provides. An unbelievable number of people are using Facebook, Twitter, and other social media channels to check out practices and read comments from real patients. Research shows that when friends refer friends to a doctor, that referral carries more weight than any other form of marketing. Make sure you add social media icons and links to your website pages so that users can share any information they find on your site with others. Social media is the ultimate way to get word-of-mouth referrals. 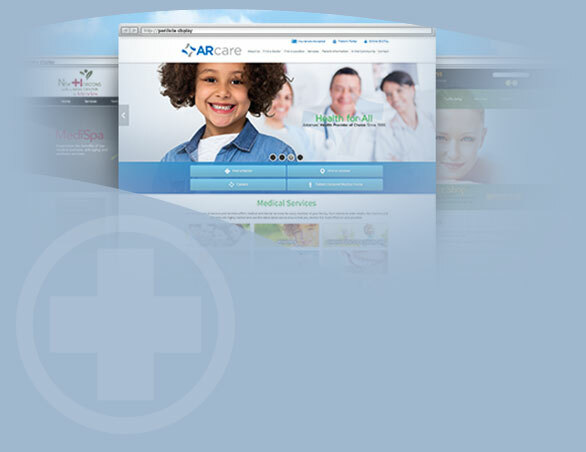 Medical professionals come to iHealthSpot for medical website design because they know they need a site that fits the unique needs of their healthcare practice. It needs to look great: it should be intuitive and clean, not confusing and cluttered. It needs to function properly, both now and in the future. And it needs to set you apart from your competitors, while inviting your patients to learn more by delving deeper into your site. If you are interested in learning more, contact us today, toll-free at (877) 709-0999 for your FREE consultation with our web experts today! What Makes Online Directories/ Listings Important? Online directory listings are available 24/7, which makes them a significant part of your digital marketing strategy. Unfortunately, many of these directories create profiles for you and your practice without your even knowing it. They do this by pulling data from other sources, which often leads to profiles with inaccurate, missing or outdated information (think old address, wrong phone number) that can have a big impact on your practice. Claiming your online directory listings allows you to edit your information, including your address, logo, contact information, video links, office hours, specialty and social media links. We suggest creating an outline of the content you will use for your listings to ensure you use the exact same information for each one. Details as minor as the formatting of your phone number, how your office hours are entered, and whether you use DPM on one site and D.P.M. on another can lead to confusion for potential patients. You can also customize your profile when you claim your listings. We suggest making the most of the expanded listings offerings to provide as much information as people in your community might need to help them make the decision to choose your practice. And don’t forget to include a link to your website! Once search engines such as Google, Yahoo! and Bing see a link from an online directory to your practice’s site, they’ll consider you “reputable” and will accordingly push your website up in the search rankings. If you haven’t claimed your online directory listings yet, you may have the wrong information reaching potential patients, not enough information on the web, or find bad reviews or comments that could be affecting your practice in a negative way. Managing and monitoring each and every directory listing takes time – time which most medical practitioners would rather spend taking care of their patients! That’s why iHealthSpot offers a full range of online marketing services, providing the expertise and experience that you need to create online directory listings that will help you grow your practice. If you are interested in learning more, contact us today, toll-free at (877) 709-0999 for your FREE consultation with our experts today! Studies show that people are spending twice as much time online as they were just 12 years ago, with the average adult spending more than 20 hours online per week. This means that digital marketing channels such as websites, social media, pay-per-click (PPC) advertising and search engine optimization (SEO) are more important than ever before. It also means if you don’t yet have a digital marketing strategy in place that incorporates all these activities, you could be missing out on hundreds – even thousands – of potential patients every year. 1. The latest research shows that more than 80 percent of the U.S. population has at least one social networking profile. This means that having an active social media presence for your healthcare practice has become almost as important as having a website. While there are several platforms to choose from (e.g., Facebook, Twitter, and Pinterest to name just a few), they all have one thing in common: they provide an easy and efficient way for you to interact and engage with your patients and have become a very viable way to find new patients and engage with them socially online. 2. More than 50 percent of millennials search online for health information and rely on online patient reviews before choosing a new healthcare provider, according to this survey. The global average for all patients was almost 60 percent. And this number is expected to continue to grow. This means that every healthcare practice – including yours – needs to be proactively managing, monitoring, and amplifying their online reputation. 3. One of the nicest things about digital marketing is that everything is measurable. When running any type of program – from SEO, PPC to social media to email marketing – you know how many people saw your campaign, visited your website, and contacted you for more information or to book an appointment. Paid search placement, in particular, works well with other online marketing channels. It lets you know which keywords are a good fit for your website. It drives patients to your website. It helps you get more email sign-ups to enrich your email marketing campaigns. And you only pay when someone clicks on your ad, which provides a very clear return on investment (ROI). The online world is extremely competitive, so good digital marketing results may take time. The good news though, is that companies like iHealthSpot offer a full range of online marketing services, providing the expertise and experience that you need to create a digital marketing strategy that will help you grow your practice. If you are interested in learning more, contact us today, toll-free at (877) 709-0999 for your FREE consultation with our experts today! But how well can you diagnose and treat your online presence? If you have a website and know you need SEO, that’s a good start. But in today’s digital world, web marketing goes far beyond this, and a well thought out plan for online marketing is crucial to growing your patient base. So. Where to begin? In this iHealthSpot series, we’ll help you on your way to a healthy online presence and share the strategy behind improving it with five key elements of online marketing. By the end of the series, you’ll know how to use these marketing mediums to increase your visibility online, increase your patient base and grow your overall business. We’ll begin with website design, and delve into today’s best practices for modern, effective website design in “Check your Website’s Vitals.” We'll touch on the importance of brand identity, modern techniques for mobile friendly web design and how to us your website to reach and capture your target audience. We’ll cover effective copywriting and the importance of regular additions to content through blogging. We’ll also cover important interactive features such as online appointment requests and online bill pay and why it is imperative to offer these tools to patients. For many patients, the “how” of getting well is foreign to them, as are all the medical terms doctors use. For most of our physician clients, the same holds true where search engine optimization (SEO) is concerned. Though you know you need it, the science of how it works is often daunting and confusing. What goes into optimizing a website for search engines? What is a metatag or page title? If these terms aren't familiar to you and you’d like to learn more about what goes in to optimizing your site for search, make sure to read “SEO…The Cure for an Invisible Website.” We’ll explain exactly what goes into search engine optimization and how to ensure your site ranks for all the keywords related to your specialty. Did you know social media is the fastest growing and most cost-effective marketing platform today? An unbelievable number of people are using Facebook, Twitter, and other social media channels to check out practices and read comments from real patients. Discover the best social media platforms to promote your website and business in "The Social Media Epidemic." There are so many platforms to choose from that it can be overwhelming. In this article, we'll narrow it down to the most popular platforms and the most relevant for medical practices to best promote your medical services, and engage with patients. You’ve worked hard to build your reputation as a respected medical professional in your community, but have you invested in building that reputation online? Negative reviews reach a large audience and will have a negative impact on your business. In "Decontaminating Negative Reviews", we'll share the value of staying on top of your online. Reputation and you’ll learn how pro-active reputation management can not only minimize the effects of negative reviews, but also positively impact your business with positive ones. Some people shy away from “paid” ads on search engines. They are told that “organic SEO” is better. In the final part of our series, we'll explore the creation of a PPC (pay-per-click) campaign. If done properly, a PPC campaign has the potential of becoming your most effective form of online marketing. We'll explain why in "PPC: Seek a Second Opinion." A strong online presence won't happen overnight. It takes a multi-tiered approach across multiple online mediums. With a good website as your foundation and an experienced agency partner, the sky is the limit. A great place to start is with education. Be sure to join iHealthSpot for this informative series, designed to give you the insight you need to tackle the online world and ultimately conquer it! You don’t need to do anything. Just look for an email each month on these exciting topics and make some time to read and embrace them. If at any time you’d like to discuss any part of the series with a marketing consultant,, just contact us at (877) 709-0999 and we’ll be happy to have a complimentary, no obligation consultation with you! Healthcare Marketing: Do Online Directories Actually Matter? You’ve worked hard to build awareness of your healthcare business in your local community, but have you invested in building that awareness online? General online business directories are a great place to start listing your medical practice. By linking your website to these types of business listings, you’ll see a significant boost in website traffic and, as you know, more views typically lead to more patients. Once search engines such as Google, Yahoo! and Bing see a link from an online directory to your practice’s site, they’ll consider you “reputable” and will accordingly push your website up in the search rankings. Also, don’t forget to include a “local” element by having your practice listed under your suburb. Many people prefer to know that their healthcare provider is nearby, staffed by local people, and caring for the local community. In addition to general directories, you will also want to list your practice on healthcare-related directories, such as WebMD.com, Healthgrades.com, and Vitals.com. These types of sites are directories, as well as online resources for information about symptoms, general wellbeing, and health news. They all have millions of regular site visitors every year so, similar to general online business directories, they’ll help increase both your website traffic and search engine ranking. As many of these sites also offer reviews, you’ll want to monitor them on a regular basis to ensure you’re managing (and keeping control of!) your online reputation. The good news: online directories don’t require you to be particularly “tech savvy”, and they’re easy and cheap (often free!) to set up. However, they do pose one challenge. Writing content for an online healthcare directory is different that writing for your own website. You have a limited amount of space, which means the content you create needs to make an impact and it has to create a good impression – quickly. In addition, it’s important that your business information is listed consistently for all online directories and that you have a keen eye for detail when submitting your content. Details as minor as the formatting of your phone number, how your office hours are entered, and whether you use, for example, DPM on one site and D.P.M. on another can lead to conflicts within your local business listings, and confusion for potential patients. Online directories are an important, and often overlooked part of any healthcare marketing strategy. iHealthSpot offers a full range of online marketing services, providing the expertise and experience that you need to create online directory listings that will help you grow your practice. If you are interested in learning more, contact us today, toll-free at (877) 709-0999 for your FREE consultation with our experts today! Patients today do a considerable amount of online research before visiting a healthcare practitioner. This means that before a patient decides to contact you, they will search your website (and increase your social media accounts) for valuable and relevant information. If you want to market to them effectively, your website needs to provide as much specialty-specific educational information as possible. And with today’s increased competition for people’s attention, this content needs to be authoritative, interesting and share-worthy. The more medically reliable, easy-to-understand information you can provide, the more you will build engagement – and trust – with your future patients. Social media is no longer a trend, it’s a way of life. Every minute of every day, there are 900,000 Facebook logins, 452,000 tweets sent and 46,200 Instagram posts (Source: Business Insider). And every post and tweet provides you with a way to connect with patients, as well as establish online relationships that help build trust and credibility. Done well, social media can boost awareness of your practice and generate new patients. The good news is it’s not complicated. However, you do need to create compelling healthcare content that is shareable, fresh, unique and – most importantly – attracts their attention. Technology is enabling a new generation of online marketing delivery systems that enable you to identify patient interests and deliver timely and relevant content on a one-to-one basis. For example, you can now retarget display ads to individuals who indicate and interest in your website or use marketing automation to create user profiles that help you to send personalized messaging. This “customized” content is more attention getting and generates greater interest and response because patients want to be treated like a person vs a number. Personalizing content for your patients is no longer a nice to have, it’s a must have. If your website isn’t mobile-friendly yet, then it should be! In the U.S., four out of every five Americans own and use a smartphone, and this trend will continue as sales of mobile devices continue to rise. That’s why it’s critical to meet the needs (and expectations) of your patients and provide them with easy access to you with either a responsive website or mobile medical website. Both options ensure patients have an effortless online engagement with you. And both options now earn higher rankings in search engines like Google, Yahoo! and Bing. Medical professionals work with iHealthSpot because they know they need a full-service digital marketing partner that can support the unique needs of their healthcare practice while staying up-to-date on the latest marketing trends and technologies. From award-winning medical website design and proprietary patient education content to online marketing including social media, we enable medical practices to market themselves using proven digital marketing strategies. If you’re interested in learning more, contact us today, toll-free at (877) 709-0999 for your FREE consultation with our marketing experts today!